WWE Champion Randy Orton tried on his professor's cap when Monday Night Raw touched down in the Great White North. Orton confronted his SummerSlam opponent, John Cena, with a little history lesson. Namely, The Viper reminded Cena how he had defeated him in a Triple Threat Match at WrestleMania XXV and, more recently, at Night of Champions. For his part, Cena is no teacher's pet. The former Champ exchanged pointed words with Orton until they were interrupted by the Unified Tag Team Champions, Chris Jericho & Big Show. The two bragged about how they had convinced Raw's guest host, Sgt. Slaughter, to arrange two main event matches: Big Show vs. Orton and Chris Jericho vs. John Cena. Call it home country advantage. When Canadian Gail Kim faced off against Kelly Kelly, Beth Phoenix and Alicia Fox in a Diva Four Way Match, with the winner earning the right to face Divas Champion Mickie James in a title match, the odds were not in her favor. However, anyone who has witnessed the Korean beauty in the ring knows that she has never let the odds mean her end. After overcoming the size and strength advantage of her opponents, Kim emerged victorious and now sets her sights on Mickie and the Divas Title. In the tug-of-war that has ensued over the past two weeks between Jack Swagger and Evan Bourne, “The All-American American” pulled his adversary over the line. After splitting one victory apiece, Swagger came up big to win the tie-breaker. Before he could revel in his arrogance, however, MVP challenged Swagger to a fight. “The All-American American” deferred, saying that maybe he would battle the Ballin' Superstar next week. MVP pushed him on his derriere before Swagger slid from the ring. It looked like it was over for The Miz. Last week, the brash braggart lost to John Cena and found himself banned from Monday Night Raw for good. Well, heee's baaaccckkk! The scheming Superstar, calling himself “Calgary Kid,” donned a mask and fought Eugene in a WWE Contract-on-a-Pole Match for the right to become the newest official member of Monday Night Raw. After prevailing, Miz ripped off his mask to reveal his true identity. Randy Orton may be conniving, devious and underhanded, but he's no dummy. The WWE Champion had been scheduled to battle Big Show in one of the night's two main events. The Viper, however, thought better of facing off against The World's Largest Athlete and risky injury with less than two weeks until one of the most important matches of his career against John Cena at SummerSlam. Instead, after suffering a beating at the meaty paws of Show, Orton, in a calculated move, exited the ring and walked off, allowing the angered giant the victory by count-out. After getting in the face of Jack Swagger earlier in the night, MVP's adrenaline must have been pumping when he faced Chris Masters one-on-one. Montel Vontavious Porter managed to capitalize on his quickness and athleticism, handing Masters a loss. Any celebration got cut short, though, when Swagger came to the ring. As MVP faced him, Masters locked in the Master Lock. That's when Swagger decided to act and pummeled a weary MVP, leaving him hurt in the middle of the canvas. Regeneration X? There had been no sign of Shawn Michaels ever since his loss to Undertaker at the 25th Anniversary of WrestleMania in an epic match. Finally, however, Triple H managed to track down the elusive Superstar ... in a corporate cafeteria? That's right. It appears HBK had decided to go underground, working as a cook, when his former DX partner pleaded with him to reform DX and compete against The Legacy at SummerSlam. To The Game's relief, and the WWE Universe's delight, Michaels agreed. Chavo Guerrero didn't seem like he wanted to press his luck. In the wake of his pathetic losing streak to Hornswoggle, the so-called “Mexican Warrior” decided to forgo a tag team match against 'Swoggle & Mark Henry. Instead, Guerrero chose to substitute The Legacy. While it was nothing to be proud of, Cody Rhodes & Ted DiBiase did manage to secure the win thanks to a pin on the little leprechaun. Feeling confident, the second-generation Superstars then addressed DX, saying they were definitely ready to face down the legendary twosome. Perhaps hoping to boost his standing with his fellow Canucks, Chris Jericho wanted to accomplish something in front of them he'd never done before; defeat John Cena. Well, that quest went about as far as a moose on a motorcycle. As one half of the Unified Tag Team Champions, Jericho certainly held his own against Cena. Unfortunately for him, though, Randy Orton wanted to send a message to his SummerSlam opponent and interfered in the bout. The intrusion triggered an immediate disqualification and also prompted Big Show to rush to the ring. The Unified Tag Team Champions then teamed up to overwhelm Cena and Orton, leaving the two lying on the canvas. The pandemonium led Raw guest host Sgt. Slaughter to interrupt the proceedings to announce that next week, not only will Freddie Prinze, Jr. act as Raw's celebrity guest host, Cena & Orton must combine forces to face Show & Jericho. As if to demonstrate their uneasy alliance, Cena & Orton immediately joined together to collar The World's Largest Athlete and send him over the ropes. The cooperation was quickly followed by looks of apprehension on the faces of both Superstars. Will these two really be able to bury their animosity and work as a team on the next edition of Raw? RICHMOND, Va. – Alors que l'issue d'Extreme Rules a secoué l'Univers de la WWE moins de 24 heures auparavant, le Draft 2010 de la WWE qui s'est déroulé lors d'une édition spéciale de trois heures de Monday Night Raw a fait trembler quelques-unes des Superstars elles-mêmes jusqu'à la moëlle, quand les grilles de Raw et SmackDown se sont affrontés dans des match inter-promotions pour déterminer quelle grille aurait le droit de piocher. L'Univers de la WWE pourra vivre d'autres chocs post-draft mardi soir, sur wwe.com, où se déroulera le Draft Complémentaire de 2010. Ne ratez pas les dernières secousses sismiques. Rage? Déception? Honte? Après s'être retrouvé les pieds scotchés au pilier du ring par le Champion de la WWE John Cena et avoir perdu à Extreme Rules, il y a de grandes chance que Batista ait ressenti les trois. Ce qui pourrait expliquer sa motivation d'avoir empêché le match entre Sheamus et Randy Orton pour la place de Concurrent n°1 au titre de la WWE. L'Animal a rugi qu'il méritait de participer à ce match. Alors que le Guerrier Celte et la Vipère se sont bruyamment opposés à cette requête, John Cena a réglé la question en organisant un Triple Threat Match. Le vrai nom de Triple H est Paul Lévesque, et il est né le 27 Juillet, 1969. Il a été formé en vertu de Killer Kowalski avec son partenaire Ted Arcidi. Triple H a commencé sa carrière de lutteur sous le nom de Terra Ryzing. Il se débattait dans les Indes, puis il a fait à la WCW. Il a obtenu au départ en WWF où il a travaillé plus d'heures pour moins money.In avril 1995, il a fait ses débuts en tant que Hunter Hearst Helmsley et c'est ainsi que son nom a été inventé comme Triple H. Il a joué un gros snob du Connecticut. Il a été inventé comme King of the Ring en 1996. Toutefois, Stone Cold Steve Austin a remporté le match peu après et Triple H dû abandonner le titre. 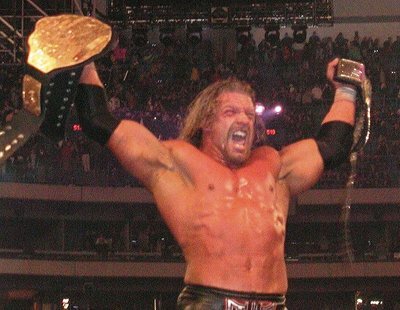 À la fin de 1996, Triple H était le champion Intercontinental. En 1997, il a formé la classe D-Generation X avec Shawn Michaels, et Chyna était sa petite amie pendant cette période. 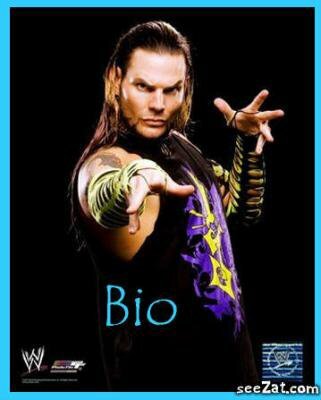 Shawn a pris sa retraite et Triple H devient le leader du groupe. En 1998, Triple H a subi une blessure au genou. Il a dû prendre une pause d'une durée de neuf mois à compter de la lutte. Il est retourné au Royal Rumble et a remporté le titre WWE de Chris Jericho. En Octobre 2003, Triple H marié Stephanie McMahon, et ce fut un incident de la vie réelle. Même après un long moment après que Triple H et Stephanie partagé une relation à l'écran. En 2003, Triple H conduit un nouveau groupe qui a été appelé l'Evolution. Les autres membres du groupe ont été Dave Batista, Ric Flair et Randy Orton. Ce groupe contrôlaient à eux seuls RAW pour 2 ans. En 2004, il a écrit un livre intitulé Making the Game, qui était tout à propos de fitness. Phillip Jack Brooks (né le 26 Octobre, 1978), mieux connu sous le nom de ring CM Punk est un catcheur américain actuellement sous contrat avec la World Wrestling Entertainment (WWE) dans la division SmackDown. CM punk est cinq fois champion du monde : ROH World Championship une fois, le Championnat ECW une fois et World Heavyweight Championship trois fois. CM Punk a également remporté le World Tag Team Championship (avec Kofi Kingston), et le WWE Intercontinental Championship. Après avoir fait ses gammes dans le circuit indépendant et la ligue ROH, CM Punk a signé à la WWE en 2005. Il a d'abord commencé dans la ligue de développement OVH ou il a tout gagné. Punk a toujours utilisé la gimmick de straight edge, un style de vie qu'il suit dans la vie réelle (pas d'alcool, pas de drogue ...).